Jen Esquer is a Doctor of Physical Therapy and movement enthusiast. 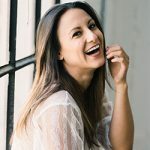 She treats patients privately in Los Angeles and has online programs called The Mobility Method and The Optimal Body that reach people globally. She uses her social platforms to push educational videos on how to maintain mobility, increase strength, and prevent pain throughout the body. As a former gymnast of 9 years and pilates instructor for 6 years, Jen is an avid mover who dabbles in AcroYoga, calisthenics, weight training, pilates and yoga. Her vision is to empower others to continue to move and live a pain-free, active lifestyle.